Shades were originally designed to do specific things; keep out the sunlight or give privacy. While they still perform the same function, the shades of today do much more! At, Shades of Beauty, our family has spent more than 20 years changing and perfecting the shades of yesteryear, moving into the 21st century and taking the traditional shade along with us. We are your best choice for custom shades and installations. We size and fit to any window. With our customizing service, you can now have a beautiful shade that matches your curtains or wall treatments. The material choices go beyond the customary vinyl! our custom shades are second to none! Our woven wood shades are both stunning and highly functional. These beauties will enhance the mood of a room and are an excellent form of keeping light and weather-generated temperatures, out when desired. Then there are the Roman shades. It is such an easy and beautiful way to add a touch of elegance to your home. The Roman shades are beautiful and "soft" looking when in the down position, yet even the graceful way they pull up when you want the windows exposed, is beautiful. The fabric options are many and can be coordinated with the décor of your home. You might also consider the balloon shade; certainly a stand-out treatment for your windows or interior glass doors. These can also be made many fabrics which then give that finished and complimentary look to any room. And, have you ever considered the pleated shade? These are another fabulous option to bring variety to the look of your windows. 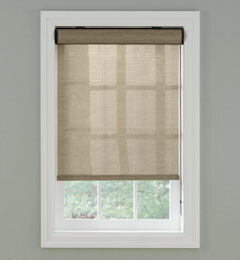 At, Shades of Beauty, we have many, many types of custom shades that will be perfect for any room in your home. Take a browse through this section and see what happens to your imagination! For another unique idea, click on our Shade-O-Blind tab and see a whole new, exclusive option! "Window shop," if you will and then call or come down and sit with our Home Design associates. Our no obligation estimates are always free.